Kopaonik has over 60 kilometers of alpine tracks, 6 FIS paths for slalom and giant slalom. Routes served by systems of 24 ski lifts, total capacities of over 33 000 skiers per hour making it one of the largest ski resort in this part of Europe. The center has three six-seat, seven four-seats (4 detachable - 6 600 skiers per hour and 3 ordinary - 4 200 skiers per hour) 2 two-seats and 14 ski lifts. From the tracks Kopaonik has 15 easy 10 medium and 7 black tracks. Skiers can enjoy daily floodlit skiing on the slope opposite "Konaci" apartments (Lift No 3). Kopaonik is a very compact resort enjoying an excellent 'ski to door' reputation, all of Kopaonik's amentities are within 10-15 minutes 'walk to centre'. . For those hotels, apartments, holiday homes and other facilities that are located far away from the starting lift stations, there are several private ski carriers regularly used to transport. In addition to tracks for alpine disciplines, in the area of ​​the Flat Kopaonik there are 12km (route of 3km, 5km and 10km) of trails for Nordic skiing. For the safety of the skiers-there is organized mountain rescue service, named GSS (this is Serbian abbrevation). GSS takes care of safety during the entire season on all tracks of the Tourist Center Kopaonik. In case of need, please contact your local member of the GSS, the hotel reception or emergency service, GSS is on duty 24 hours. See the live show - which lifts and slopes are operational. 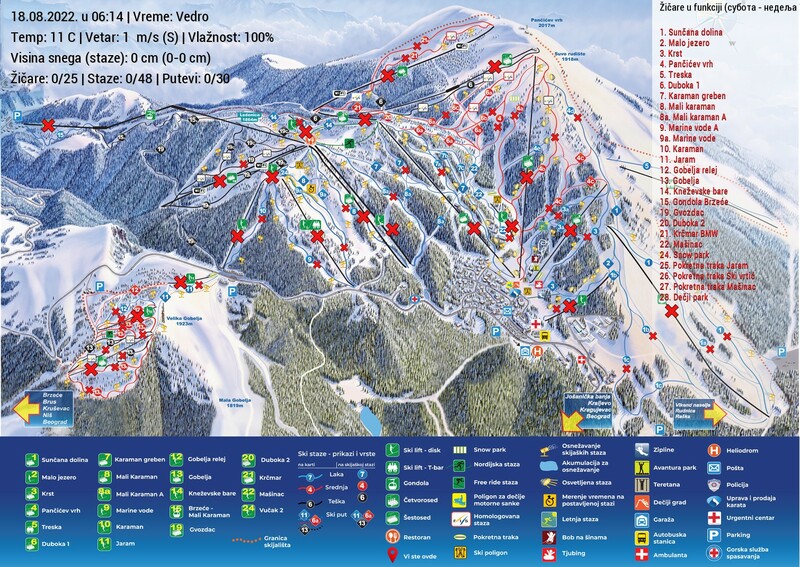 Ski map is automatically generated at each change of data on lifts and slopes mobility.